It always seems like on the hottest day of the year that your air conditioner decides to quit and shut down, leaving you and your family to struggle through the heat. Even on days when the weather isn’t extremely hot, we’re sure everyone would appreciate the ability to control the temperature in their home. Without this control, you may have a hard time sleeping, irritability rises, and there could even be a risk of health issues. But aside from calling for air conditioning service, what can do you do when the AC unit isn’t turning on? The air conditioning experts at All Air Heating & Cooling Services want you and your family to be prepared if this situation becomes a reality. So if your AC unit fails, first call us right away to schedule an appointment. We’ll send out a technician as soon as possible to make repairs or, if necessary, suggest a completely new system. If this is the case, you may be able to fix the problem by yourself. 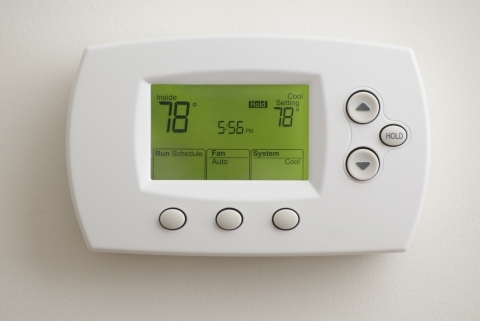 There are a few things you can do to test if the thermostat is working or not. First, try replacing the batteries. If the batteries are dead, the thermostat won’t be able to tell the unit that it needs to turn on. If that doesn’t work, try turning on your air conditioner manually. If the AC turns on, you’ll know that all you need to do is replace the thermostat. If the AC unit caused the breaker to trip, this should also be an easy fix. Simply locate the correct breaker that the air conditioner is on and flip the switch. You will soon be enjoying some cool air in your home. If the thermostat and circuit breaker don’t seem to be the cause of the issue, there could be either electrical or water damage. In this case, look for rusted or leaking tubes, or debris surrounding the unit. Call a professional air conditioning service for repairs if you see signs of damage and avoid trying to fix the issue yourself. 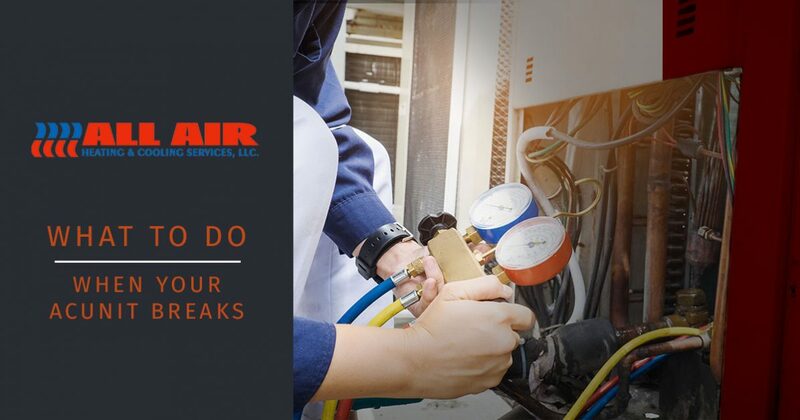 When there’s no hope of a quick fix and you’re waiting for professional AC repairs, it’s important to take steps in order to keep your family as cool as possible. Lower the shades during the day, especially if you have south facing windows which let in the most light and heat. When the sun goes down, open the windows so that cooler evening air can come in. Also consider placing a box fan in the window to pull in cool air. One of the biggest challenges when the air conditioner goes out is sleeping. Because this material breathes easier, use as much cotton as possible, including pajamas and sheets. Before heading to bed, take a cool shower or at least soak your feet in a bath of cool water. Unplug any large electronics that could generate heat in your room or home. At All Air Heating & Cooling Services, we will do our best to get to your home quickly so that you can have control of the temperature once again. If you believe that a family member is at risk of health issues because of the heat, call the authorities who will be able to help. Schedule an appointment with All Air Heating & Cooling in Fredericksburg today.